Ballads are listed by sheet, in alphabetical order of title, using the abbreviations and conventions listed below. 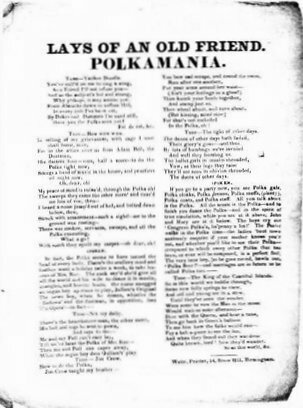 The work will be completed by an alphabetical index of all the titles and tunes listed - probably in instalments as with this article..
SL: National Library of Wales, Broadside Collection (formerly belonging to S. Baring-Gould; catalogued by C R Johnson and C P Thiedemann under the title of Street Literature, 1980). * Indicates item without imprint, but ascribed to printer in whose list it appears. First lines, where given, are in round brackets. A number after a title in square brackets is is the serial number given by the printer to the sheet listed. A date in round brackets after a title is mentioned in the text of the sheet or can be deduced from it. Thomas James Vale had a long career as a printer at Suffolk Street (1820), Church Street (1821-24), 29 Cannon Street (1827), 29 Moor Street (1828-30), at 3 Freeman Street (1832-38), and finally at 113 Moor Street (1850-55). 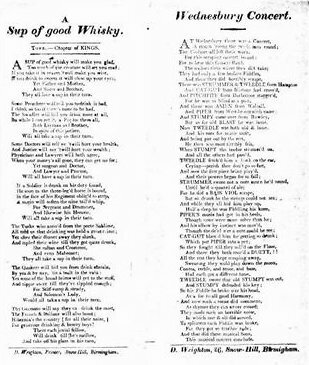 During his time at Freeman Street he reprinted on broadsides extracts from newspapers on topical events such as French losses at the siege of Antwerp (1832), fire at the Palace of Westminster (1834), 'Dreadful Riots at Dudley' (1834, of which the copy is annotated 'Hawked in Bewdley Market') and a 'great discovery' (1836). Only one of these (see below) involved verses. From 1802 until 1812 Wadsworth was listed at 88 Lichfield Street as a bookseller only. By 1814 he was a printer also, and had moved to 71 Lichfield Street, where he remained until 1817. 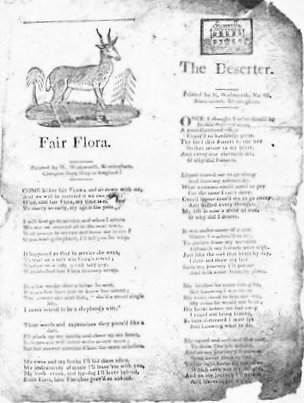 One sheet (no.26, below) bears this imprint: 'Printed and sold Wholesale and Retail by H. Wadsworth, 71, Lichfield-street, Birmingham: where Shopkeepers and Travellers will find the greatest variety, and at the lowest price'. From 1817-18 Wadsworth was in Moor Street, at nos 12 and 90. Francis Henry Wakelin was printing at 354 Wheeler Street from 1886. As F.H. Wakelin Ltd the firm was still there in 1940, advertising as 'Printers and Publishers', 'Calculator Specialists', and producers of 'Reckoners for all Trades, Professions and Municipal Authorities'. It was still in existence in the 1970s, at 328 Witton Road. Frank Wakelin (as he styled himself then) apparently issued just one sheet, dated 1899, which relates to the death of General Penn Symonds during the South African War. 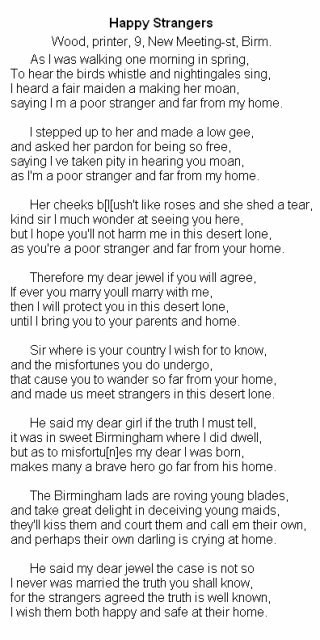 Perhaps this was the last Birmingham street ballad. Watson became a well-to-do printer and newspaper proprietor. His main career was at 24 High Street (1831-32), 26 Church Street (1832-34), and 23 Temple Street (1845-54). He issued ballads only from his first and least salubrious address, Jamaica Row (1826), in what must have been his earliest venture. 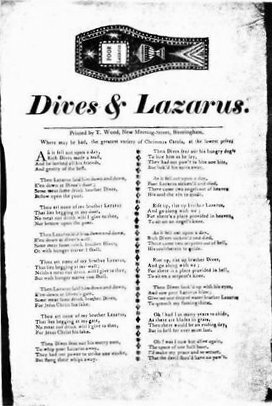 The sheets, in most cases headed Christmas Carols, have the manuscript annotation of 1826, though one additionally has 'Christmas Eve 1824'. All are in the Bodleian Library. In the case of two items, nos 11 and 44, below, Watts published jointly with (George) Paul of London. He seems to have a particular affection for 'sheets', six inches across by twenty-four down, with the texts of up to 33 songs. I have seen only one sheet bearing the imprint of E. Watts, 14 Snow Hill, and it is otherwise identical with T Watts's no.39, above. 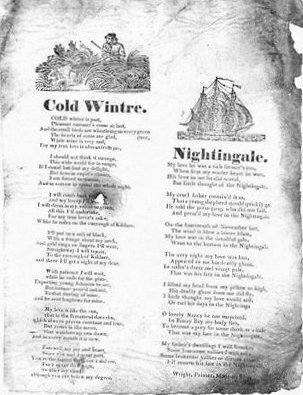 Despite being a somewhat shadowy figure, and also possibly short-lived, Whiting issued a substantial number of ballad sheets. In 1832 he was in partnership with Joseph Russell as a stationer and bookseller, and in the following year was registered as a printer on his own account. His final appearance in a Birmingham directory, in 1835, was at 21 Moor Street, the address which appears in well over half his extant sheets. A small number have the imprint of Moor Street only but just under a third, 134 Moor Street. It seems reasonable to assume that 134 preceded 21, and a few sheets were issued twice, once from each of these addresses. Charles Wilks, Charles Grafton and Edward Reddell were printers, stationers and booksellers, as well as publishers of books and a newspaper. There were various permutations: Grafton and Reddell (1797-1802), Wilks, Grafton and Reddell (1802-04) and Wilks and Grafton (1805-09). By 1810 the firm had become simply Wilks and Co, and in 1811, C Wilks, bookseller and stationer. I have seen only two ballad sheets of theirs. Wilson and Co, Printers, sometimes John Wilson and Co, was in existence over a very long period, at a series of different addresses: Livery Street (1846-47), 28 ½ Ann Street (1849), 100 New Street and 28 ½ Ann Street (1852-54, and in the last of these years also at 14 Ingleby Street), 100A New Street (1855-56), 6 ½ Moor Street (1858), 100A New Street (1861-71), 99D New Street (1872), 99C New Street (1875), 100 New Street (1876-77), 99C New Street (1878-92) and 110 New Street (1894-96). During that period of half a century a solitary sheet was issued, from 100A (or rather A100) New Street. Wright, who was born in 1796, operated successively from 2 Carey's Court, Moor Street (1820-21), 113 Moor Street (1822-26), 17 Moat Lane, Smithfield (1827-29), 22 Digbeth (1829-30), 3 Moor Street (1831-35), 99 Lichfield Street (1837), No.1 House, No.17 Court, Lichfield Street (1842), and 93 Lichfield Street (1845-55). He was sentenced to eighteen months' imprisonment in 1827 for forging pedlars' licences, but managed to afford a visit to America in 1837. He was nevertheless not affluent: the 1851 census shows him at 93 Lichfield Street with his wife, Mary, and two lodgers. (My thanks to Keith Chandler for the information from the census). He was succeeded by R Peach (see part 2, above). One of his sheets (no.7, below) is marked sold by W Marshall, of Lawrence Hill, [Bristol], and two others (no.100 and 133) by W Horsley, Sadler Gate, Derby. Wright's imprint is sometimes limited simply to 'Birmingham'. I have indicated other addresses shown as M (for Moor Street), 3M and 113 M (numbers 3 and 113 Moor Street respectively), C (Carey's Court), D (Digbeth), S (Smithfield), 17L, 93L and 99L (17 Court, Lichfield Street, 93 and 99 Lichfield Street). This enables close dating than would otherwise be possible.